Japan - the second largest market economy in the World? ��ࡱ�>�� ce����b�������������������������������������������������������������������������������������������������������������������������������������������������������������������������������������������������������������������������������������������������������������������������������������������������������������������������������������������������������������������������������������������������������������������������������������������������5@ ��0�cbjbj�2�2 (��X�X8Y�������������������8� ���_v���������������$�R'������������������������������� 0�^Q������/0_�� � � �������� �� ���������1. Introduction. Now the Japanese economy is the second large market economy in the world, Japan accounts for approximately two-thirds of the total GDP of Asia and therefore has played a major role in Asia economy. Japan is the biggest investor in Asia countries and a crucial financier of world financial markets. Its economic health is important to the overall global economy, especial in Asia Pacific Business Region. Since Japanese "bubble economy" collapsed in 1991s, Japan has grown poor economic performance for several years (1). Moreover Asian financial crisis in 1997 has affected Japanese economy recovery, but Japan still holds the key to successful economic recovery of the APBR. 2. 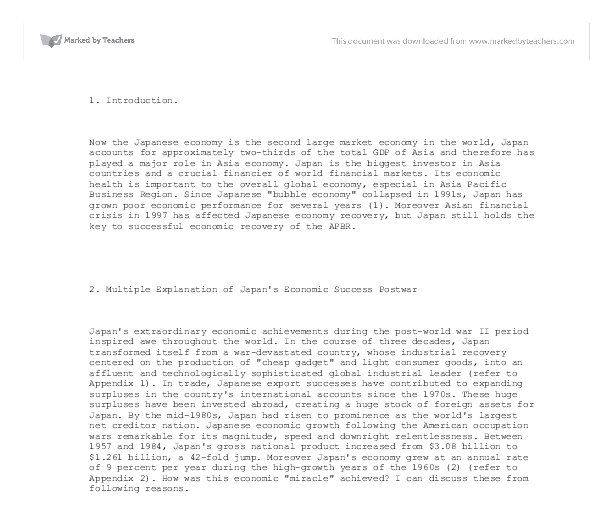 Multiple Explanation of Japan's Economic Success Postwar Japan's extraordinary economic achievements during the post-world war II period inspired awe throughout the world. In the course of three decades, Japan transformed itself from a war-devastated country, whose industrial recovery centered on the production of "cheap gadget" and light consumer goods, into an affluent and technologically sophisticated global industrial leader (refer to Appendix 1). In trade, Japanese export successes have contributed to expanding surpluses in the country's international accounts since the 1970s. These huge surpluses have been invested abroad, creating a huge stock of foreign assets for Japan. By the mid-1980s, Japan had risen to prominence as the world's largest net creditor nation. Japanese economic growth following the American occupation wars remarkable for its magnitude, speed and downright relentlessness. 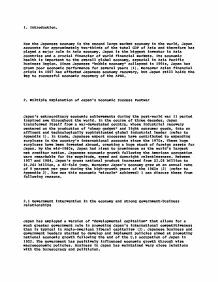 Between 1957 and 1984, Japan's gross national product increased from $3.08 billion to $1.261 billion, a 42-fold jump. Moreover Japan's economy grew at an annual rate of 9 percent per year during the high-growth years of the 1960s (2) (refer to Appendix 2). How was this economic "miracle" achieved? I can discuss these from following reasons. 2.1 Government intervention in the economy and strong government-business relationships Japan has employed a version of "developmental capitalism" that allows for a much greater government role in promoting Japan's international competitiveness than is typical in Anglo-American liberal capitalism (3). ...read more. For example, the share of export to East Asia out of Japan's total export increased from 23% in 1985 to 43% in 1996. Similarly, the import share from East Asia also increased from 25% in 1986 to 35% in 1996. Foreign direct investment by Japan in Asia increased two-fold between 1992 and 1997 to $12.26 billion. Japan's government-business alliance is pursuing an Asia-wide version of developmentalism. That is, it is exporting to the region a set of pro-growth government policies and cooperative industry practices designed to help heading manufacturing firms achieve efficiencies and market power by adopting successively more advanced technology (12). Since the mid-1980s, Japanese multinational enterprises (MNEs) have been building vertically integrated production network that they dominate in and across Asian economies. Manufactures of such electrical products as TVs, VCRs, and refrigerators opened assembly plants in China, Thailand, Malaysia, and other countries in Asia where work quality are high and labor inexpensive. On the supply side, Japanese capital continues to follow into Asia in impressive amounts ($7.76 billion in manufacturing investment in 1995, - a 57 percent increased over the volume in 1994). More and more Japanese manufactures are moving into the region. On the demand side, Asian countries continue to rely heavily on Japanese technology to fuel their increasingly export-oriented economies. In 1994, 52.3 percent of Malaysia's technology was imported from Japan, compared with 22.7 percent from the United States (13). In 1995, when Japan undertook FDI, 24 percent of the Japanese affiliates in the Asian newly industrialized economies (NIEs), 33 percent of those in the ASEAN -4 (Malaysia, Indonesia, Thailand, and the Philippines) and 21 percent of these in China. I can mainly talk about the relation about Japan and China, Japan and ASEAN nations. A.Japan - Chinese economic relation Total trade between Japan and China amounted to around US$64 billion (1997), China is Japan's second largest trading partner, which Japan is China's largest trading partner, and interdependence is deepening. ...read more. "Since during a planned economic system the level of output is "over estimated" by contradictory statistics without the consideration of "value added" in accordance with the market prices, hence, during the transition there will be a collapse in the output of the country" (1). The Role of the Informal Sector in the National Economy. market and shortage of customer's leads to low and irregular business cash flow. * Poor productivity due to regulations, transport issues, etc. * Thin profit margins relative to time invested and high running costs relative to turnover lead to difficulties with paying for supplies. The growth of the tin industry and immigration were closely linked with both peaking at 50,000 tons and 150,000 persons respectively in 1895. Such large-scale immigration helped shaped the future demographic composition of Singapore, with Chinese making up the majority. Economically, the increase in immigration spurred greater increases in trade. Independence for French Indo-China and Indonesia was Japan's goal but the immediate objective was confined to securing Japanese political and economic predominance in those countries. 'Asia for Asians' was the objective of Japan's mission to end Western influence and to bring freedom and prosperity to all races living in the Sphere. in infrastructure as well as adopting other prudent pro-development policies such as a comparative advantage trading policy. Since then Botswana has experienced rapid economic growth and has had enjoyed the highest rate of per capita growth of any country in the world. Also there is less labour activism as high unemployment makes workers more concerned about job security. Furthermore, because of an unstable policy, South Korea is also facing an unequal economy challenges. A president Roh Moo promised that he would continue the independence foreign with USA, softly but also strictly strategies with North Korea, and sending army to Iraq. One such economist is Murray Rothbard who argues that voluntary action will always be viewed as welfare enhancing from the individual's perspective. The determination of whether or not an exchange is voluntary or not centres around the use of private property.